SKY CAPTAIN AND THE WORLD OF TOMORROW. Concept Art for Stan Winston Digital. Best conference room EVER! And I got to meet Stan himself. Interesting show – not just blue screens, but blue props, blue set pieces, blue everything and all had to be art directed. I was also the VFX Supervisor for this show at R!OT Pictures. 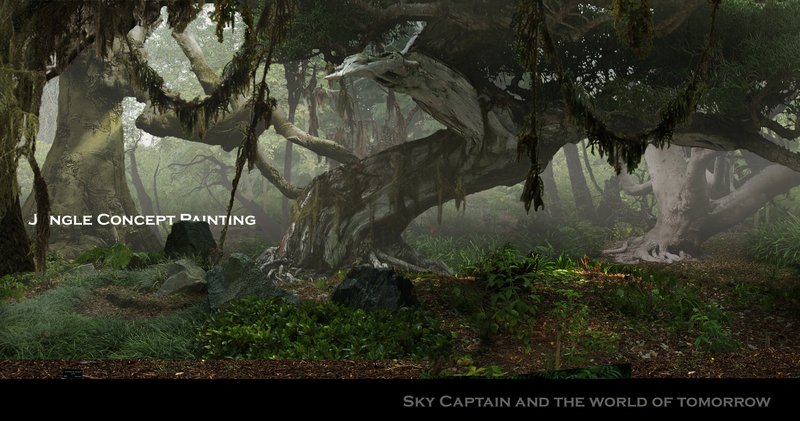 I did Matte Paintings for both facilities. I went to client meetings representing both companies and I am not sure the client even noticed. One time, when SWD and R!OT had back to back meetings at the clients place, I purposely wore a loud Hawaiian shirt. I walked out of the meeting with R!OT and immediately walked back in with SWD. I spoke as much as I could for both companies and I still don’t think the client noticed. Ha!, made me laugh.